Rainwater harvesting Filters are very important to making the water usable in any rainwater harvesting system and are used to filter debris from the rain-water as it flows from the collection roof before it enters the storage tank. These rainwater harvesting tank filters are suitable for new and existing water storage tanks including PE, GRP and concrete tanks (like for example Enduramaxx, Rototek, Wydale and Balmoral). if you need help selecting the correct Rainwater Harvesting filter for your current project. Please do not hesitate to Contact our team of experienced rainwater harvesting experts. Connectable roof areas up to 450 m². Rainwater filter for installation inside or on the tank. The VF1 Combi has the cleaned water outlet at the bottom of the filter. Whilst the dirt is washed away sidewards, the bottom cleaned water outlet position makes installing the filter in tanks very easily and practically. Where used before the tank, the Combi gives a high degree of flexibility to the angle of direction of the cleaned water outlet pipe, feeding to the rainwater tank. The VF1 Combi can also be fitted directly to the top surface of the rainwater tank, using a seal we can provide. This means it is acting as a second turret to the tank. Same functionality as 3P Volume Filter VF1 (a pre-tank filter). 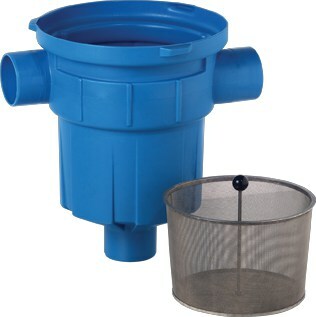 A total retention rainwater filter with integrated dirt collecting basket at mesh width of 1 mm. Easily remove the filter basket with the removal handle. For installation in a rainwater tank or turret, or before an in-ground tank using the 3P Telescopic Extension Set with lid. 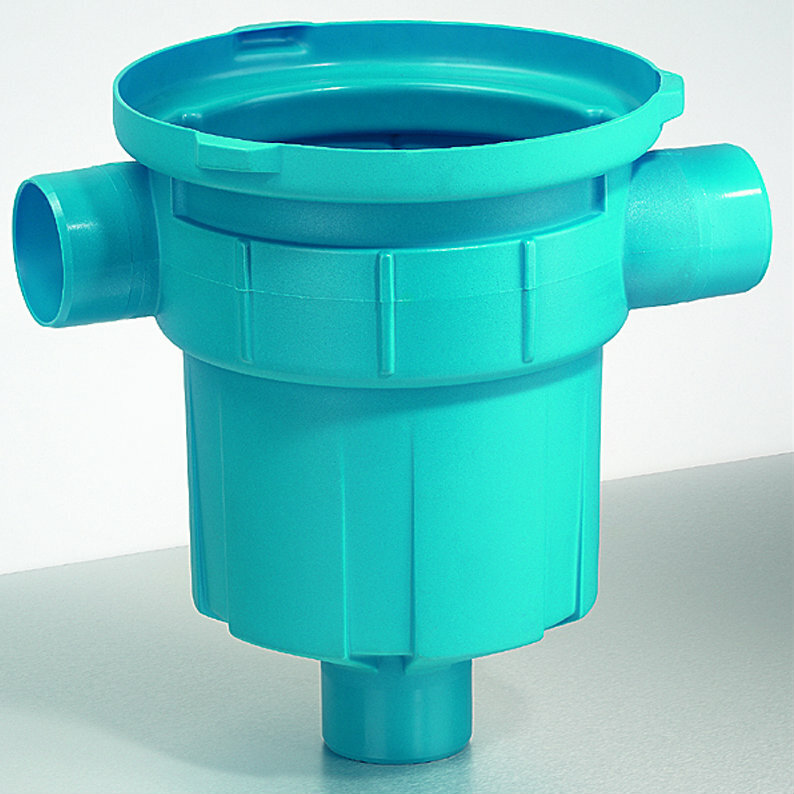 This filter is highly suitable for garden watering systems and is ideal where no connection to a sewer is possible, or where water is infiltrated. All inlets and outlets at DN 100 (110mm OD), one inlet can also be used as an emergency overflow. The cleaned rainwater flows through the bottom connection into the rainwater tank. Also a calmed inlet is recommended. Connection capacity for roof areas up to 200 m². The cleaned water can be used for garden watering. The filter should be cleaned several times during the year, depending on the solid loadings. A total retention rainwater filter with integrated stainless steel dirt collecting basket at mesh width of 0.55mm. Easily remove the filter basket with the removal handle. For installation in a rainwater tank or turret, or before an in-ground tank using the 3P Telescopic Extension Set with lid. 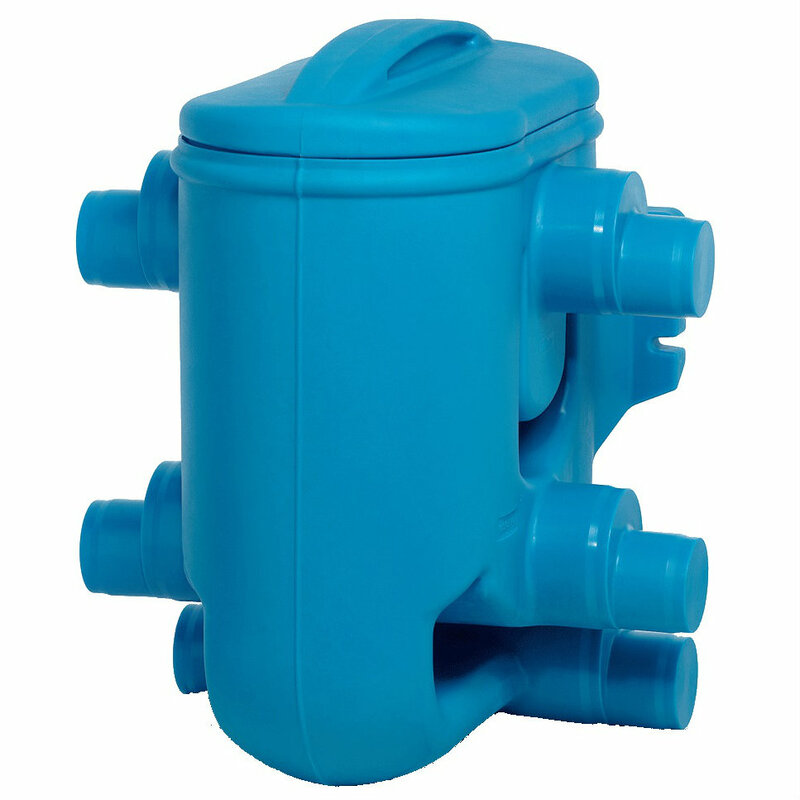 This filter is ideal for systems which use the cleaned water for flushing the toilet, washing machine, watering the garden and is ideal where no connection to a sewer is possible, or where water has to be infiltrated. A Rainwater filter for installation in rainwater tanks. Due to the inclined angle of the filter sieve and its very smooth surface structure the dirt is rinsed into the sewer. Filter cartridge mesh is stainless steel within plastic housing. Optional 3P Back-washing Device. The 3P Patronen Filter is ideally suited for use in conjunction with a 3P Overflow Siphon and the 3P Calmed Inlet. Low maintenance, self cleaning design, regular inspection and if necessary cleaning is recommended. Connection capacity in accordance with DIN 1986 for roof areas up to 200 m². All connections DN 100 (110mm OD). 66 mm drop between rainwater inlet and waste water outlet levels. Mesh size of filter cartridge 0.7 x 1.7 mm. Rainwater filter for installation in rainwater tanks. Two step cleaning system. The first coarse filter mesh protects the second, finer mesh by removing larger leaves and particles. Optional 3P Back-washing Device. 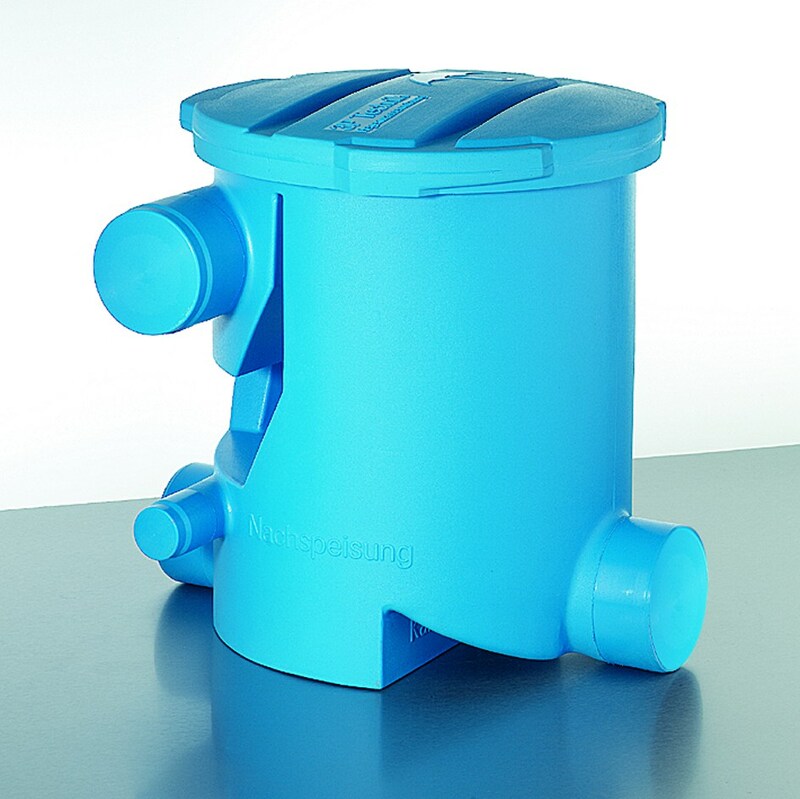 The 3P Zisternen Filter is ideally suited for use in conjunction with a 3P Overflow Siphon and the 3P Calmed Inlet. Self cleaning, low maintenance, depending on the contamination. Cleaning frequency depends upon the solids loading in the incoming rainwater. We recommend twice yearly inspections. All connections DN 100. (110mm OD) drain pipe sockets. Height difference of 117 mm between rainwater inlet and waste water outlet. Rainwater filter for installation within rainwater tanks. 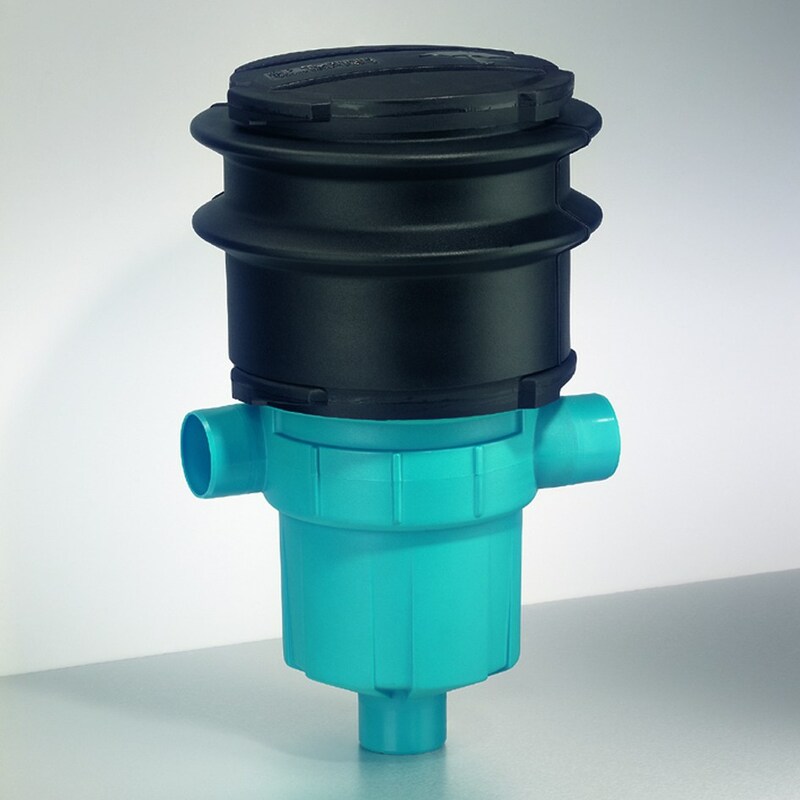 Ideal for retro-fitting in existing tanks, because the 3P Sinus Filter has no height difference between rainwater inlet and outlet to the waste water sewer. The filter cartridge lies diagonally (offset) in the housing, promoting a sinusoidal flow pattern increasing the available surface area of the filter mesh and achieving high efficiency, therefore even more water can be saved in comparison to conventional “straight through” filters. Optional 3P Back-washing Device. 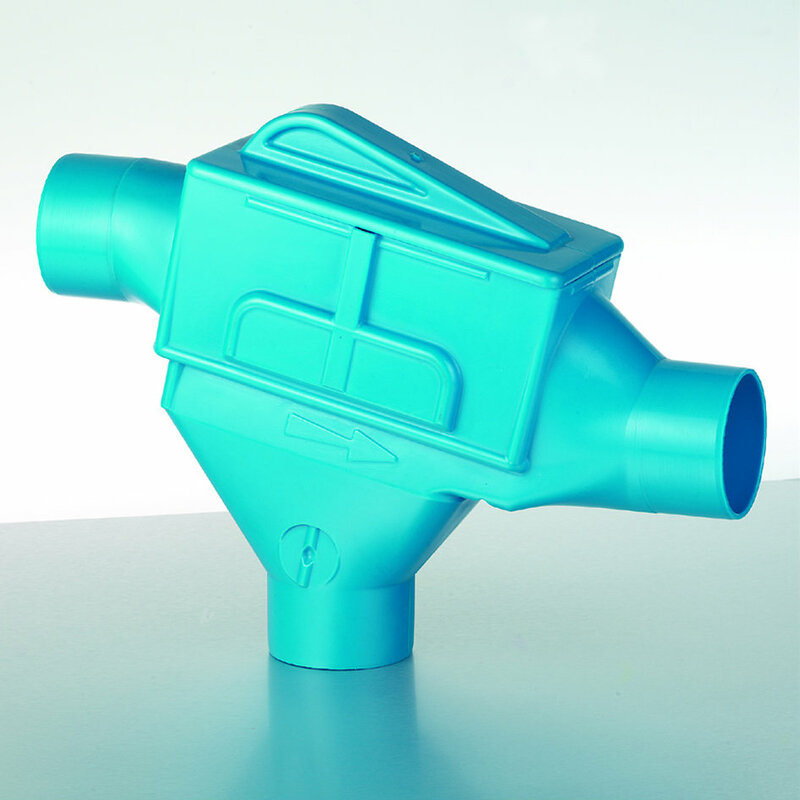 The 3P Sinus Filter is ideally suited for use in conjunction with a 3P Overflow Siphon and the 3P Calmed Inlet. Low maintenance, self cleaning, cleaning frequency depends upon the solid loading the rainwater. Height difference of 0 mm (zero) between rainwater inlet and waste water outlet. 3P Technik’s smallest rainwater filter for installation within rainwater tanks. The 3P Compact Filter is ideal where there is little room and no height difference available between inlet and outlet. Optional 3P Back-washing Device. 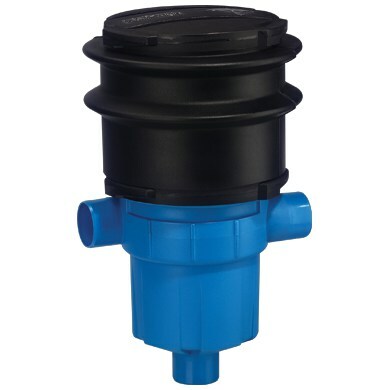 The 3P Compact Filter is ideally suited for use in conjunction with a 3P Overflow Siphon and the 3P Calmed Inlet. Low maintenance, self cleaning, depending on the level of solids in the incoming rainwater. No height difference between inlet and outlet. 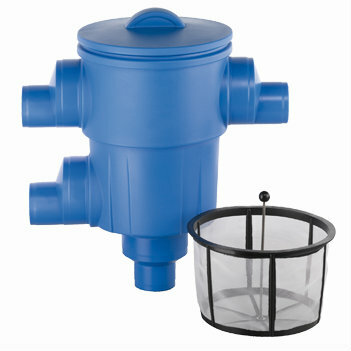 Small and compact rainwater filter for the installation in rainwater tanks made of plastics or concrete. Due to the inclined angle of the stainless steel filter sieve and its very smooth surface structure the dirt is rinsed to waste. With this filter, the overflow siphon with odour trap is already integrated. The height difference can be adjusted between 135mm and 340mm. Retro-fitting with the 3P Back-washing Device is possible. The 3P Sinus Filter is ideally suited for use in conjunction with the 3P Calmed Inlet. Connection capacity for roof areas up to 213 m². 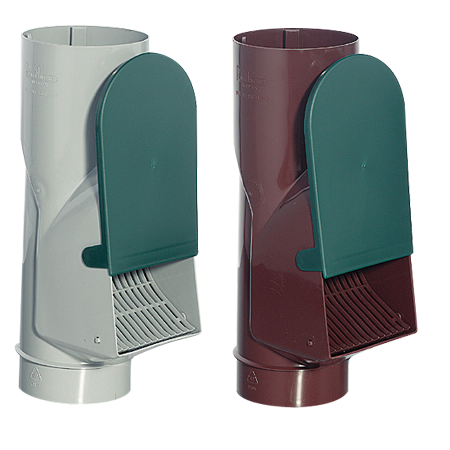 Adjustable Height difference of 135mm - 340mm between rainwater inlet and waste water outlet. 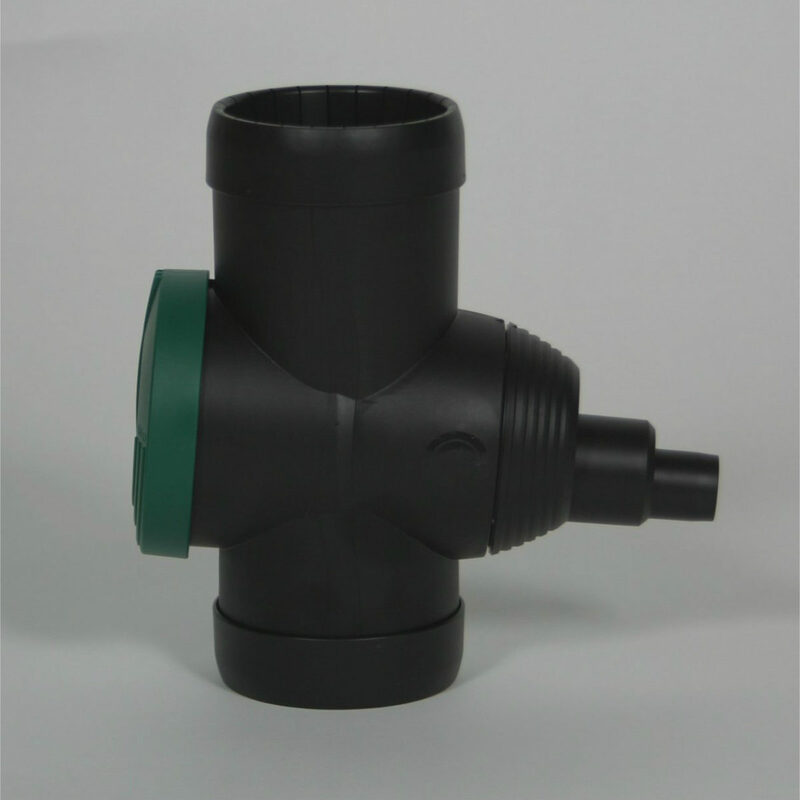 The 3P Garden Filter with plastic shaft extension tube is for direct installation in the ground before the rainwater tank, with locking lid. The extension tube is telescopic, so it can be cut to the correct height. It is simple to use and install. The extension is correctly fitted when the bayonet locking system which clicks into place. All inlets and outlets are at DN 100 (110mm OD), one inlet can also be used as an emergency overflow. 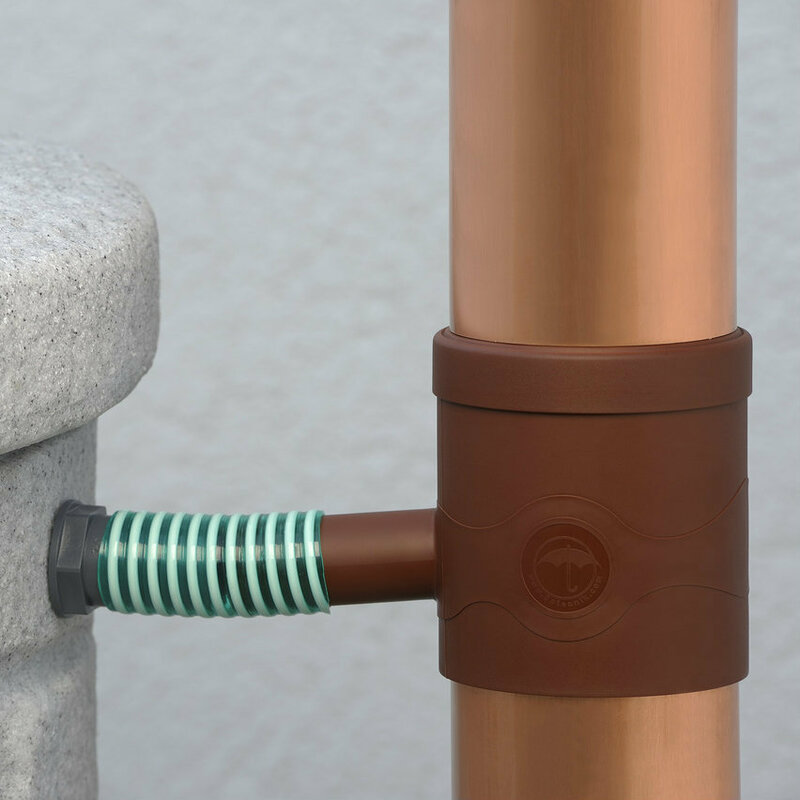 The 3P Retention Filter with plastic shaft extension tube is for direct installation in the ground before the rainwater tank, with locking lid. 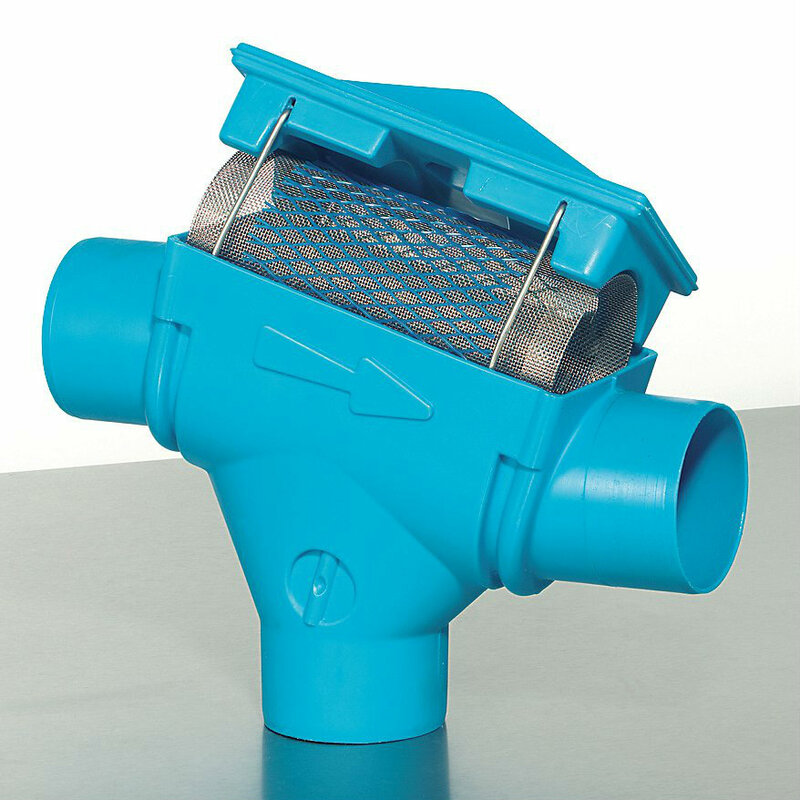 This specialised filter retains all debris in a stainless steel basket (mesh size 0.55 mm). No dirt is washed away into the soakaway or infiltration structure. This filter is suitable for systems where the water is used in washing machines, toilet flushing and garden watering, in homes, in commerce, in public buildings, in industry, and for sites in which the rainwater has to be infiltrated. This filter is ideal where no connection with a sewer is possible. The VF1 rainwater filter can be installed within a rainwater tank or before the tank in the ground. The VF1 has a high level of filtering efficiency due to its two step cleaning step, independent of flow rate. Visit our clean water page. Due to the steep inclination of the filter cartridge the dirt is continuously cleaned away to waste. The VF1 is frost resistant and self cleaning – which mean there is little maintenance work needed. To maintain: filter insert are easily removed for cleaning and does not have to be changed. Optional dirt retention basket can be supplied. Rainwater filter for large roof areas. 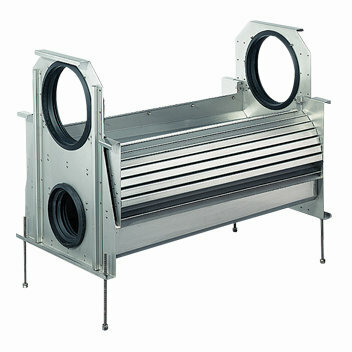 The Twin Filter can be installed in chambers underground or directly on the wall kept frost free. 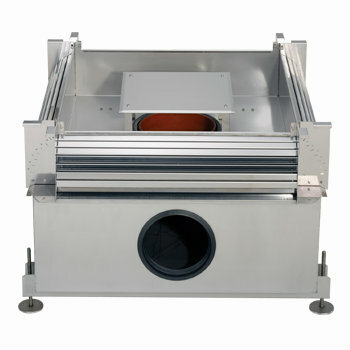 Usually installed in standard 1000mm manholes. The filter could also be pre-installed in chambers prior to delivery to site. 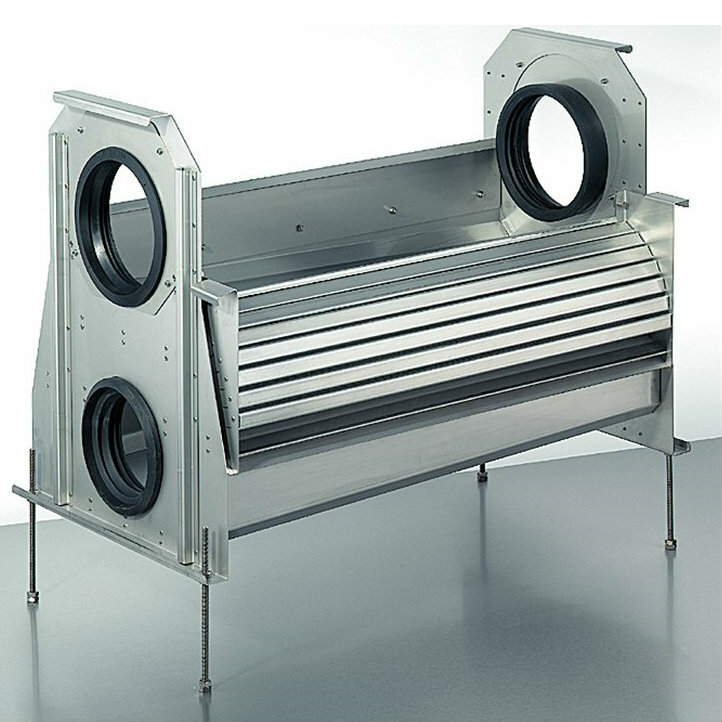 Due to its two step cleaning system, it has a high level of filtering efficiency, independent of flow rate. Due to the steep inclination of the filter cartridge the dirt is continuously cleaned away into the sewer. The cleaned water is collected in a tank and directed into the storage. 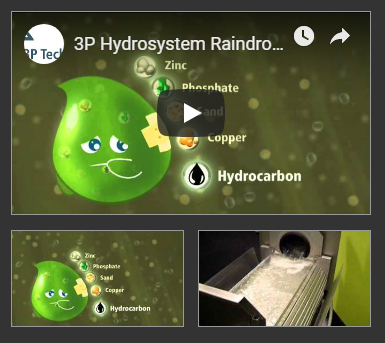 The 3p two step filtration system is a tried and tested proven technology. Rainwater filter for bigger roof areas. Filter for installation in a concrete manhole (Ø 1000 mm). Standard concrete shafts or similar load bearing chambers can be used. 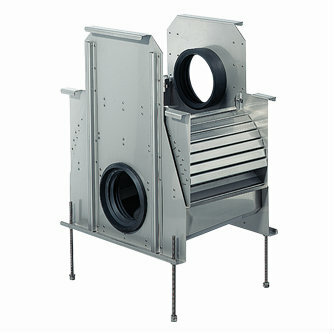 The filter can be delivered to directly to the site, yet pre-assembled in the shaft. Two step cleaning system, therefore high level of filtering efficiency, independent of flow rate. Due to the steep inclination of the filter cartridge the dirt is continuously cleaned away into the sewer. The connection to the sewer is installed at the shaft. The dirt falls down on the bottom of the shaft and is washed away with the next strong rainfall. Relative connection capacity according to DIN 1986 for roof areas up to 1200 m². Because of a Bypass-Installation a bigger area can be connected. Rainwater filter for larger roof areas. Filter for installation in a concrete ring (Ø 1200 mm). Standard concrete shafts are used. The filter can be directly delivered to the site yet pre-assembled in the shaft. Two step cleaning system gives a high level of filtering efficiency, independent of flow rate. Rainwater filter for larger roof areas. Filter for installation in a concrete ring (Ø 1200 mm). Normally standard concrete shafts are used. The filter can be delivered to the site yet pre-assembled in the shaft. Two step cleaning system, gives a high level of filtering efficiency, independent of flow rate. Rainwater filter for larger roof areas. Filter for installation in a concrete ring (Ø 1200 mm). Normally standard concrete shafts are used. The filter can be delivered directly to site . Rainwater filter for larger roof areas. Filter for installation in a concrete ring (2000mm) or chamber. Normally standard concrete shafts are used. The filter can be delivered directly to site . The Garden XL rainwater filter with locking lid for direct installation in chambers before the rainwater tank or in the tank turret . 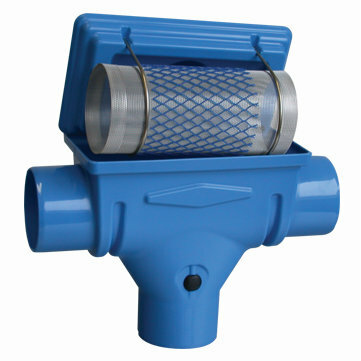 The integrated filter basket is easily removed with a removal handle. 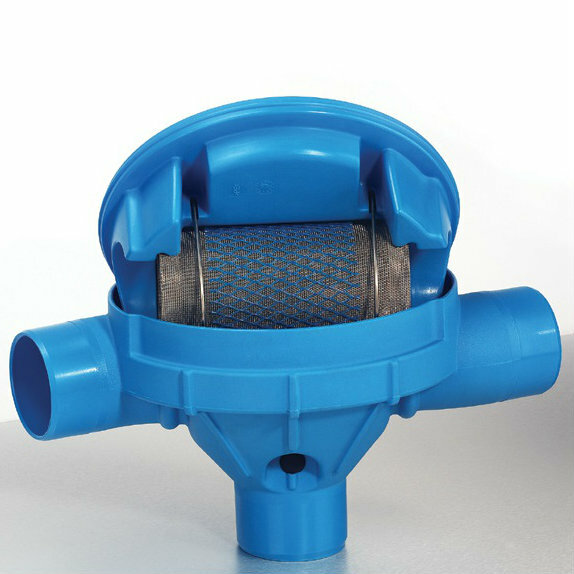 This filter is most suitable for larger irrigation systems and for sites in which the rainwater has to be infiltrated. This filter is ideal where connection with a sewer is not possible or is not needed. It is also ideal where water is to be infiltrated to ground via soakaways. Rainwater filters with locking lid and integrated dirt retention basket for installation in chambers or in turrets of a rainwater tank.The dirt basket made of stainless steel can be removed easily with the removal handle. The 3P Retention Filter XL is ideal for systems which use the cleaned water where the rainwater is to be infiltrated to ground. The two upper connections can be used as inlets, or one can be used as an emergency overflow. Either the lower side connection or the bottom connection can be used as the outlet to the storage tank. The class-leading 3P Filter Collector and 3P Filter Collector Universal filter and then divert harvested rainwater to maintain the highest quality tank water. Suitable for use with tanks of all sizes, the Filter Collector range will filter and divert water. It is the professional solution, used to fill small domestic water butts right up to industrial sized tanks of 10,000 litres or more. The stainless steel filter mesh is easily cleaned in-situ. Highly efficient. 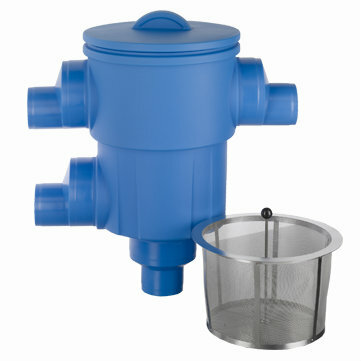 The Filter Collector is compatible with any of they 3P water butts supplied with Kit 1. The push fit hose is sealed in the tank through a thick heavy duty 50mm rubber grommet supplied in the Kit. 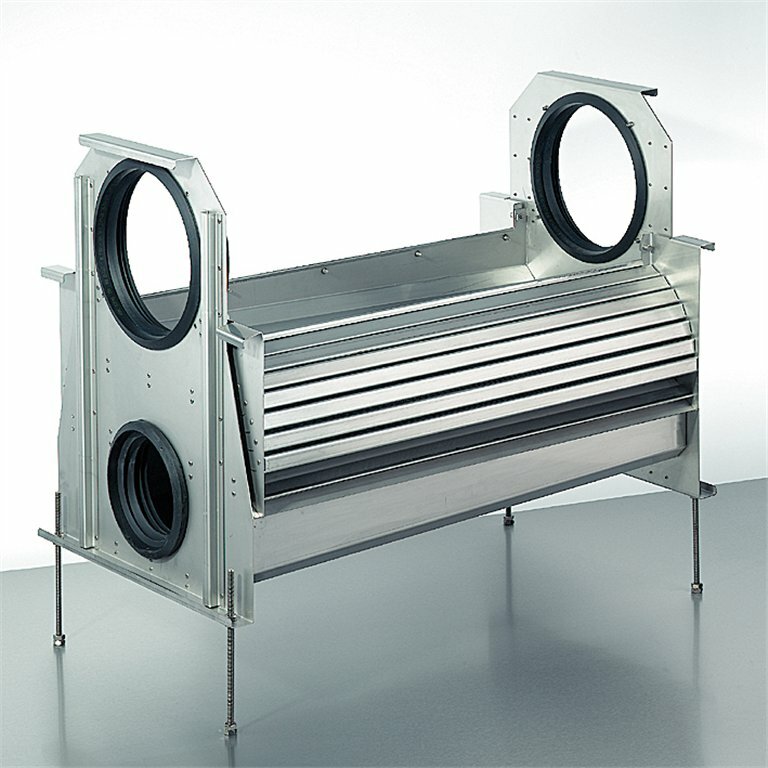 This provides a water-tight seal which allows the filter to act as the overflow point. The Filter Collector Universal includes the standard Filter Collector as well as a Universal Fixing Kit. The Kit includes a 30 cm flexible pipe, a hose tail, back nut, rubber sealing washer, and a flat bit for cutting the necessary entry point in the tank wall. 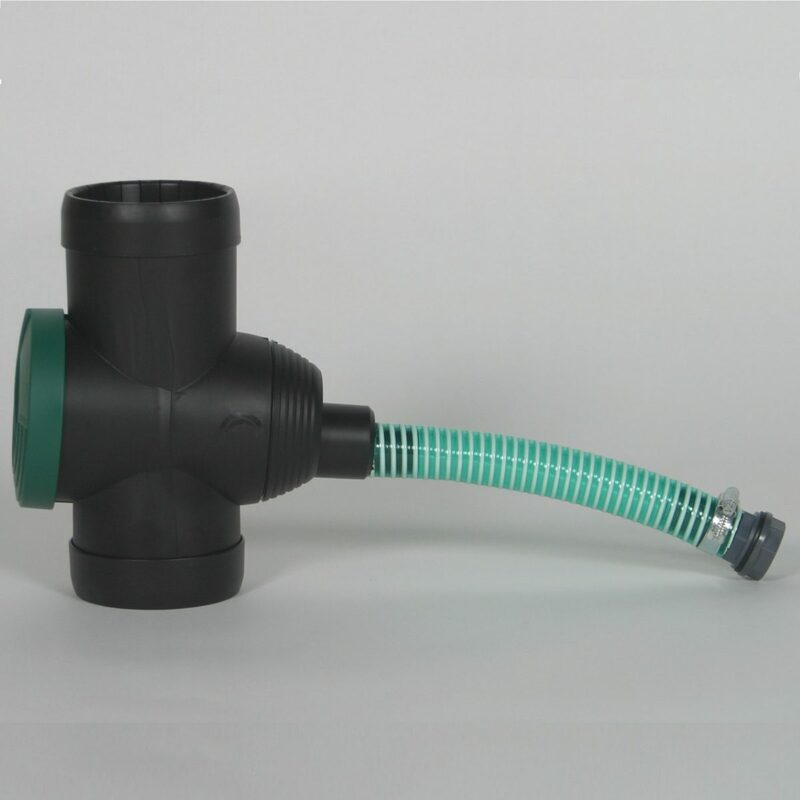 The Filter Collector Universal is compatible with any 3P or other tank of up to 7 mm wall thickness with a lid or other access point which allows one to reach into the tank to tighten the back nut to the hose tail. This provides a water-tight seal which allows the filter to act as the overflow point. The Leaf Catcher collects debris such as leaves or moss from rainwater as it is harvested. 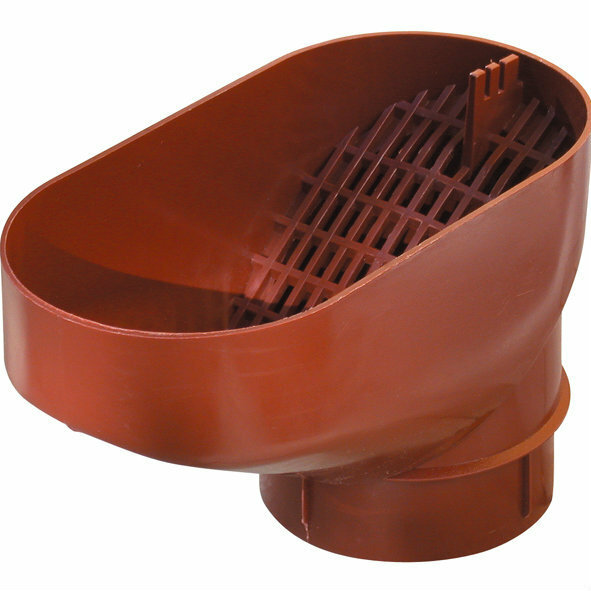 Easily maintained by periodically emptying the plastic basket, the Leaf Catcher is supplied with a UK adapter to fit 65 mm square downpipes or 68, 80, and 100 mm round downpipes. The Leaf Separator ejects leaves and larger particles out of the filter side, allowing cleaned rainwater to pass through the down pipe. Suitable for roof areas up to 80m². 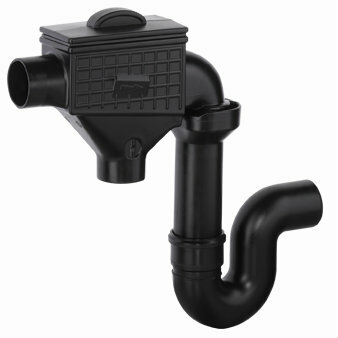 Can be installed on DN80 & DN100 downpipes. The Rain Collector separates debris from harvested rainwater with its intelligently designed coarse filter slats. 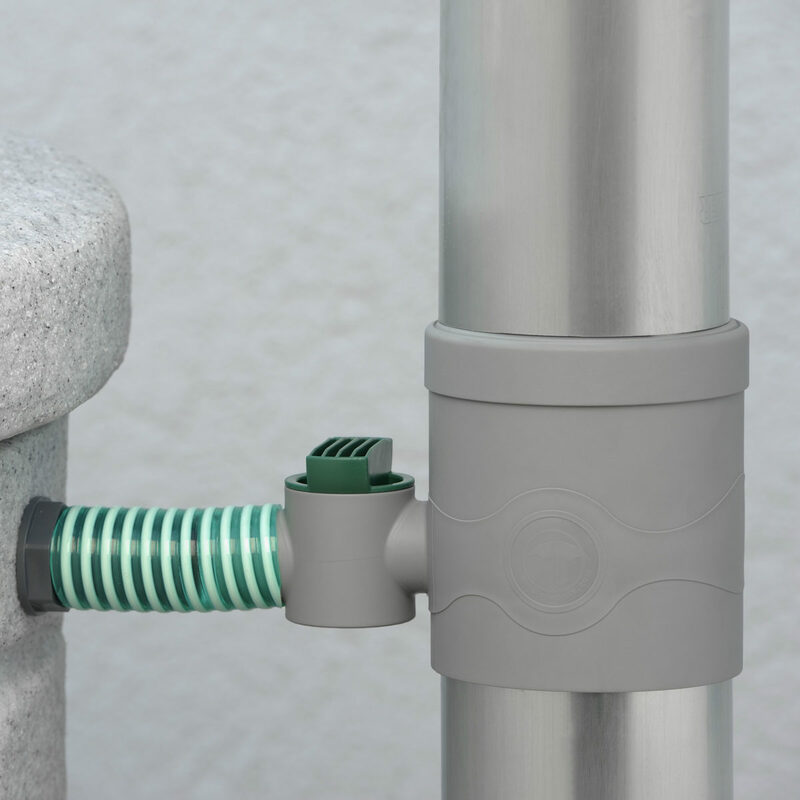 The Rain Collector with Tap is supplied with an in-built tap to control or stop the flow of diverted water, and the Rain Collector Universal is supplied with a Universal Connector Kit. The Kit includes a back nut, rubber washer, connection hose, and stainless steel hose clips. The Rainus filters debris from rainwater, allowing the clean water to continue through the downpipe. 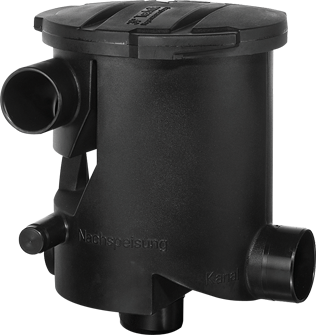 Ideal for retro-fitting systems which have not yet had a filter fitted, the Rainus is also suited to use with ponds and infiltration systems. The Standard Rainus fits downpipes of 80, 90, or 100 mm diameter. These downpipes are usually found in either aluminium or zinc. 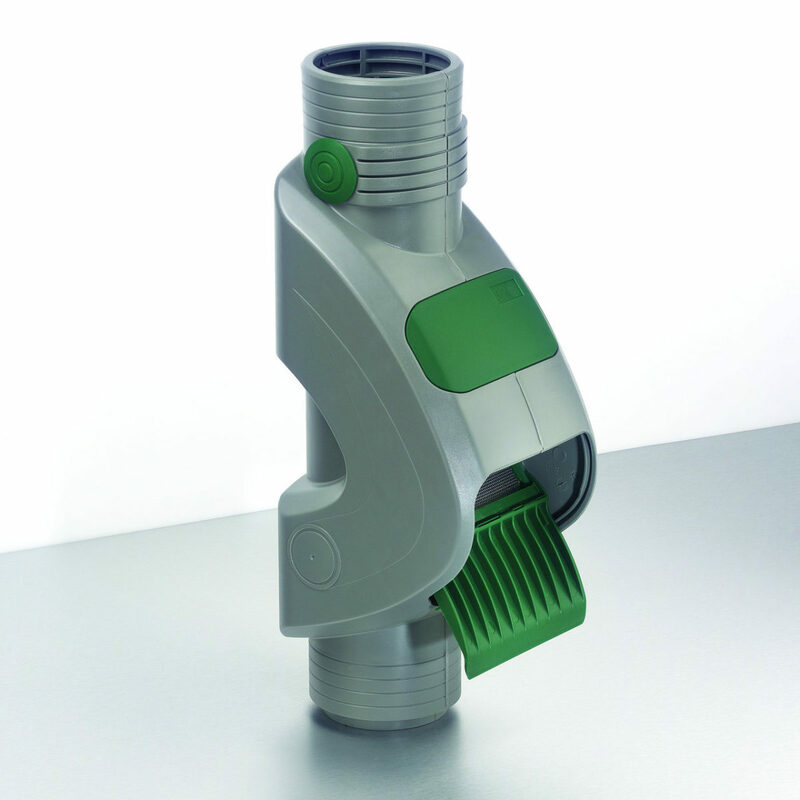 The Rainus with UK Adapters is also compatible with 68 mm round UK downpipes and 65 mm square downpipes.